The Chinese have a saying: before setting off on revenge, you first dig two graves. After the ‘Star Wars’ fuelled excesses of ‘Moonraker’, ‘For Your Eyes Only’ marks a return to a more traditional style of Bond films, one that has more in common with the espionage-centric plotting of the early Bond films. There’s something of a greatest hits of Bond feel to the twelfth entry in the series, with nods to ‘On Her Majesty’s Secret Service’, ‘Thunderball’ and ‘From Russia With Love’. Despite this being John Glen’s first foray into the world of 007 he captures the essence of Fleming’s gentleman spy and went on to repeat this with varying degrees of success in three further Bond films. The opening scene however, feels completely incongruous when considered with the rest of the film. It starts off in somewhat emotional style with Bond visiting his wife’s grave (recalling the tragic events of ‘On Her Majesty’s Secret Service’) but is then interrupted by a dastardly assassination attempt (remotely) controlled by a wheelchair bound, bald headed, white cat stroking villain. His name isn’t mentioned during this scene but it’s clearly Ernst Blofeld – the story goes that Cubby Broccoli was reacting to some complex legal wranglings involving the ownership of the SPECTRE and Blofeld names as well as the ‘Thunderball’ story. So Blofeld is unceremoniously offed in what is a pretty cheap way to end this infamous character’s significant involvement in the trajectory of Bond’s history. In terms of the plot it’s a departure from some of the more outlandish Bond stories opting for the more sober setting of the cold war. A British spy ship with a device that can control the British fleet’s Polaris missiles (the ‘ATAC’ – which looks like an 80’s shop till) is struck by a mine leaving the valuable contents at the mercy of unscrupulous parties intent on plundering the wreckage. It becomes clear that nefarious elements are involved in securing the device and selling it to the Soviets. The villains are largely made up of mute to monosyllabic hit men, the octagon spectacled Locque and the stern East German olympian Kriegler, who make up for their lack of sneering monologues with cold blooded killing and relentless pursuits of Bond. There’s a bit of kidology over the main villain, we’re led to believe that Columbo is the villain and Kristatos is allied to Bond, but it becomes clear that Kristatos has his own motives for trying to implicate Columbo. We learn that they have a considerable amount of history with betrayals shaping their relationship but little time is spent exploring this. The cast is made up of the some of the usual returning suspects (Lois Maxwell and Desmond Llewelyn as Moneypenny and Q respectively) and some ‘Game of Thrones‘ alumni (Julian Glover as Kristatos sporting unfamiliar facial hair and Charles Dance in a non-speaking ‘heavy’ role looking every bit the swarthy villain). Notable by his absence is Bernard Lee who was due to reprise his role as M but sadly died during filming. The main Bond girl Melina (played by Caroline Bouquet) is reminiscent of ‘Thunderball’s Domino both physically and in that her character suffers losses at the behest of the villain, her parents cut down whilst secretly searching for the location of the sunken British spy ship. And as with ‘Thunderball’ it then becomes a tale of revenge. 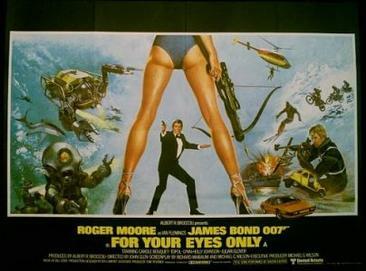 There are a number of great set pieces in ‘For Your Eyes Only’, from the Citroen 2CV chase through the countryside, some incredible helicopter flying during the Blofeld sequence and the thrilling ski chase which may well be reprised to an extent in the forthcoming film ‘SPECTRE’ judging by the teaser trailer. Glen’s director of photography makes the most of the beautiful scenery in Greece, from the olive groves to the Meteora mountains, it’s suitably exotic as we’ve come to expect from Bond’s previous adventures. Roger Moore is as charismatic as ever with one or two memorable eyebrow raises (particularly during the 2CV chase) but there’s no escaping the fact that by this film in the Bond franchise he was starting to look a little long in the tooth, particularly when he appears on screen with the twenty something Bond girls. Fortunately the ice-skating Bond girl Bibi’s attempts to seduce Bond are batted away whilst acknowledging the age difference; “you get your clothes on and I’ll buy you an ice cream”. Despite his advancing years, Moore still convinces as the smooth talking gentleman spy and whilst the fight scenes aren’t anywhere near as visceral as those in the Daniel Craig films, they are still entertaining, even when the odds are stacked against 007 as with the ice hockey attack. There are issues with the pacing in this film, some scenes seem to be interminable, particularly the scaling of the mountain to reach the hideout of the villainous Kristatos, similarly so the scene with Q and the ‘hi-tech’ facial recognition software (essentially a dot matrix printer) but the action scenes are well staged, the romantic scenes are mercifully brief and quite humorous (the Austrian Countess who slips back into estuary English once she gets Bond one on one) and there’s a bit of a thrill for Bond car enthusiasts seeing the Lotus Esprit turbo (007 warns his Italian counterpart about pressing buttons!). ‘For Your Eyes Only’ is a welcome return to a less spectacular, grounded Bond, although it doesn’t feel like an unqualified success. The espionage is in keeping with 007’s more orthodox adventures as are the more realistic action sequences, but there’s no doubt that Bond gets the best lines and it’s a shame more attention wasn’t paid to the villains who get very little to do and as such don’t rank alongside the more memorable villains in the series. There’s a distinct lack of threat and it’s easy to forget what is actually at stake. Fortunately Roger Moore’s personality elevates proceedings and in truth it’s one of his better Bond films although it fails to reach the heights of the truly great Connery offerings.